I hardly remember any details from those days after Mack died. The world continued to move, a new year had come in, yet everything had changed for us. Suddenly we had to cope with all sorts of things parents never imagine they need to deal with. My brother came to be with us, the very next day, at the funeral home, helping us pick out a coffin and making arrangements with the cemetery. Our friend and spiritual mentor Father Larry Hofer prayed with us and talked us through planning the service. Although I was now a priest as well, I had always said one of the reasons I did not want to be a parish priest was because I never wanted to perform a funeral for a child. Now we were selecting readings for our own son’s funeral, just before his 9th birthday. The community rallied around us as well. TIDES, a local charity to support grieving children, offered to meet with us, Mack’s teammates and their parents. 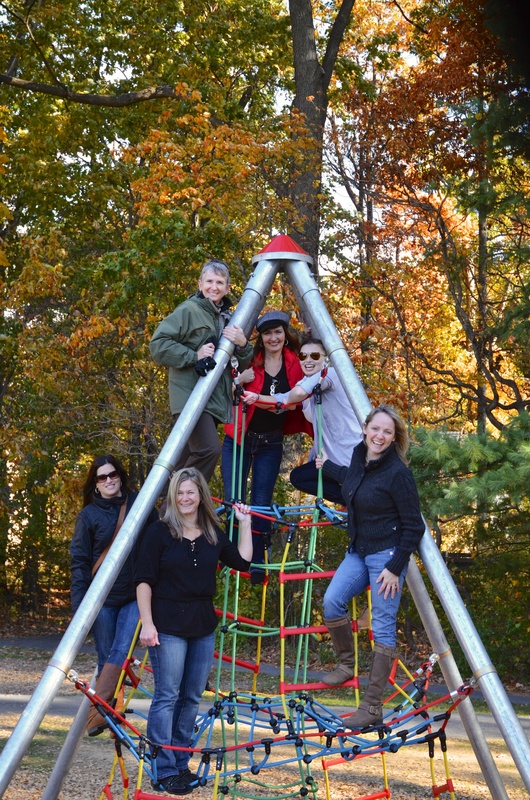 We met in the home of one of Mack’s buddies with the boys and their siblings upstairs and the parents downstairs. The TIDES workers brought great grace and helped us all begin the grieving process, but we also learned that the boys weren’t sure if they could still play soccer without their buddy, without their goalkeeper. 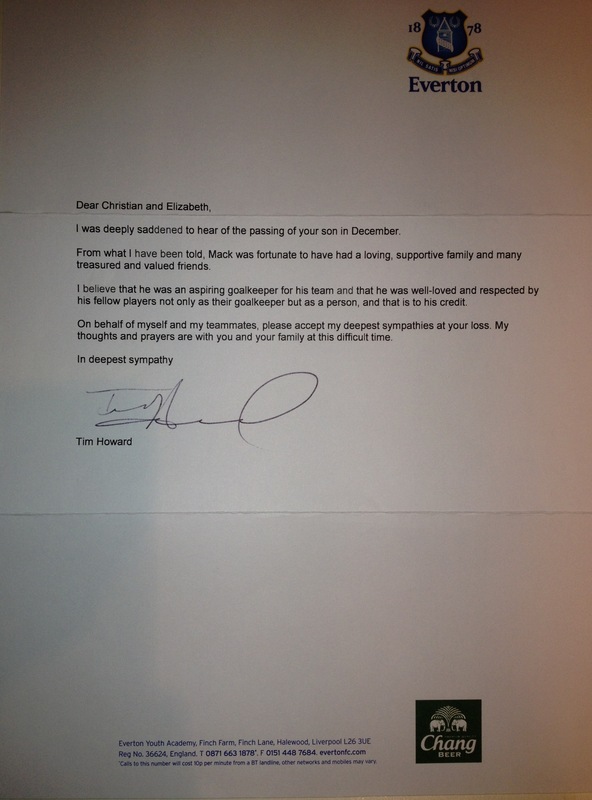 Even Tim Howard sent us a kind letter. There are so many people unknown to me who worked to bring grace into our lives after Mack died. Thank you all. We started to receive emails from soccer coaches and players around the world. It was humbling and moving as we were told time and again that we were now truly members of “GKU,” the Goalkeepers Union. Being a keeper is such a unique position that a bond is forged between them, regardless of team (watch after a Premier League or Bundesliga game, the keepers will walk across the pitch to shake their peer’s hand), and we were now part of the fold. Mack’s dream was to play between the pipes for Penn State and for the US, to be better than his heroes Hope Solo and Tim Howard. Now his teammates weren’t sure if they could go on, if they could still play the game that brought them together. A few days into that week, Todd Hoffard, then GK coach for the NY Red Bulls, sent me a note, offering his condolences and to help in any way he could. So many had made similar offers to help and I thanked him and then wrote, “You tell me. Mack is gone, but his buddies don’t think they ever want to play soccer again. How can you help Mack’s buddies?” I felt I was being a bit rude, to be honest. I wasn’t sure how he would respond. He called. We brainstormed. 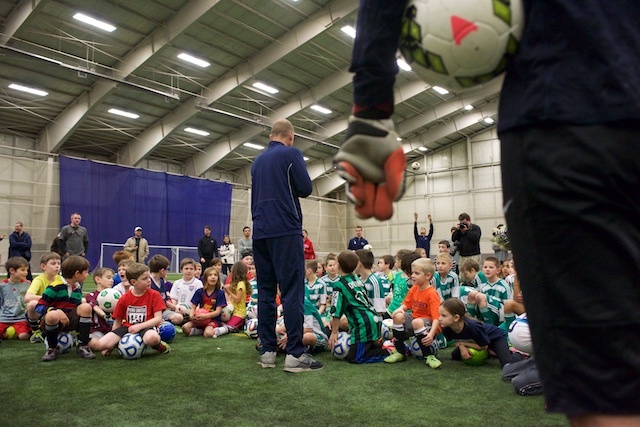 We reached out to Bob Warming and Erica Walsh Dambach, PSU coaches, and within a week, a week!, they formed the first Mack Brady Memorial Soccer Clinic. I am not sure I can convey how miraculous this was. Working at Penn State at that time I knew that the NCAA and our Athletics program were concerned to make sure that everything was done by the rules and with appropriate vetting and training. 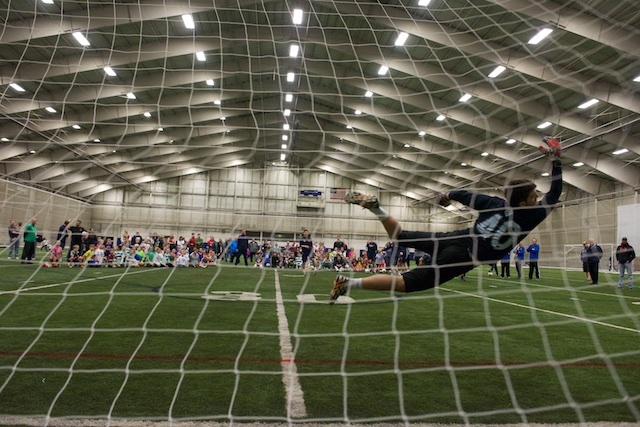 Within one week, all the players from Penn State’s Men’s and Women’s teams came back to campus before classes, completing the required training, so that they could offer this clinic and help us mourn and celebrate our goalkeeper. 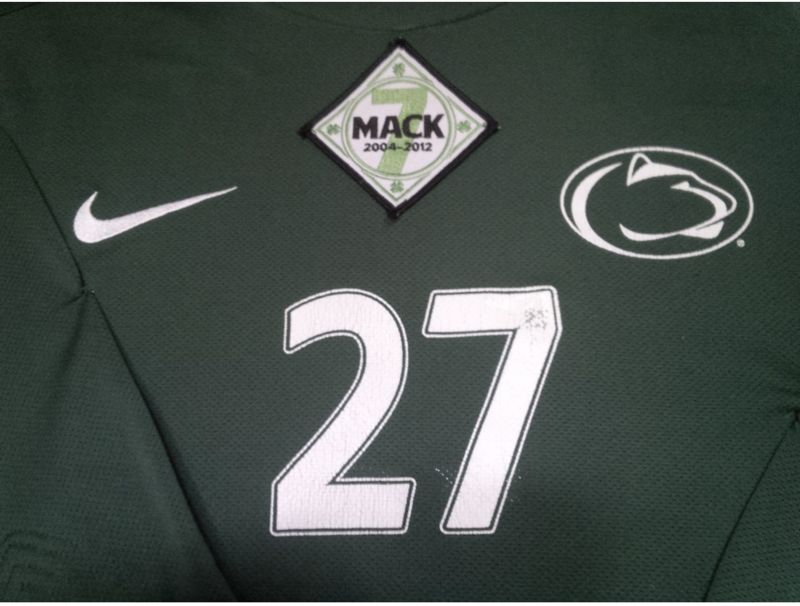 The Penn State soccer community was and remain amazing in their support of Mack. That first clinic was a joy. Yes, there were tears and sadness, but there were nearly a hundred kids there, running around, shouting, and having fun doing what Mack loved most. 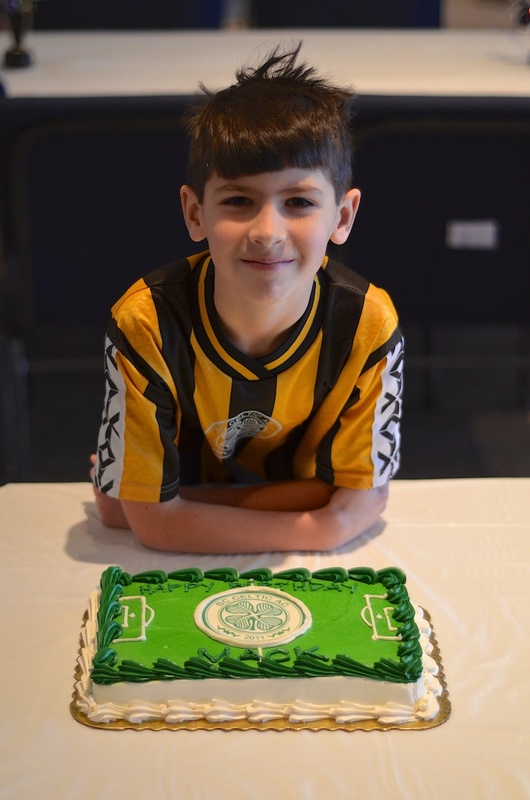 This year marks the sixth anniversary of Mack’s death yet, because so many people moved so quickly, it is the 7th Annual Mack Brady Memorial Soccer Clinic. I reached out to Todd Hoffard, the coaches, and players who made it possible to share with me some of their recollections of getting the clinic off the ground. As their comments come in I will add them to this history. First, from Todd Hoffard. As their comments come in I will add them to this history. First, from Todd Hoffard. My biggest memory was asking goalkeepers/players around the league to help and spread the word about Mack and the clinic that was being put together in his remembrance. The response that I got from players around the league and beyond to donate items to the cause was truly unbelievable! Not one player that I asked was unable to offer something. The donations just kept flowing into my mailbox! I was truly blown away how many people were willing to help. Never having the opportunity to meet Mack is likely my biggest regret as the stories that players, parents and also you shared were truly a glowing description of the person he was!! I was actually not sure what to expect upon my arrival to campus for the actual event…would it be a somber remembrance of Mack and what would the energy feel like? But, immediately you got the feeling that this clinic was a celebration of Mack and his love for the game and his friends/family! I was truly in awe of everything and absolutely thrilled to be a part of it all in such a small way! The highlight of the day was seeing the smiles of all Mack’s teammates receive some of the donations that I received from all around MLS and beyond. They were obviously in pain due to losing their buddy Mack, but for a few moments, there were smiles and happiness that was truly incredible to see. Even though I never had the opportunity to meet Mack, he will always be a part of me. He is what the GK Union is all about! We stick by each other and always have each others backs. After that conversation with Todd, I reached out to Coach Warming who called in Coach Walsh, their staff and players. Within days it was all set. The players were a key part of that, returning from their winter break early to get clearances and run the clinic. 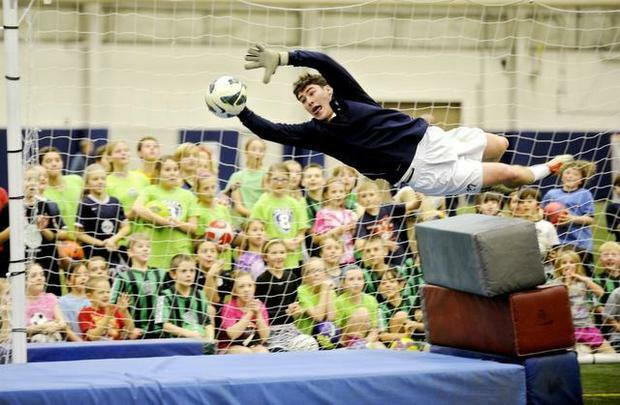 Danny Sheerin, a Junior PSU Goalkeeper at the time, has made it to every Mack Clinic. Danny shared this recollection (and see his father’s own memories in the comments below). My favorite thing about the Mack Brady Clinic is seeing the amount of kids that return year after year. It’s awesome to see the amount of enthusiasm the returning kids have on their faces walking into Holuba Hall. Watching their love for the game grow, while remembering their buddy Mack, always puts a huge smile on my face. On the flip side, I always think it’s easy to tell who the newcomers are. Often, they are hanging by their parents, nervously sitting on the sideline. However, as soon they join a rondo circle, or start passing back and forth with a Penn State player, you can watch their expression literally turn from anxiousness to excitement. Overall, I love the happiness that is packed into Holuba every Mack Clinic. Remembering Mack through smiles, laughs, goals, and tons of saves is amazing for everyone involved. Whether it is your first Mack Clinic, or you have been coming for years, you will leave with a joy that Mack brought us all together to find. Last year’s clinic was also the first day of Coach Cook’s tenure at Penn State. He came a day early to be with us to celebrate Mack and to welcome some of Penn State Soccer’s most dedicated fans. 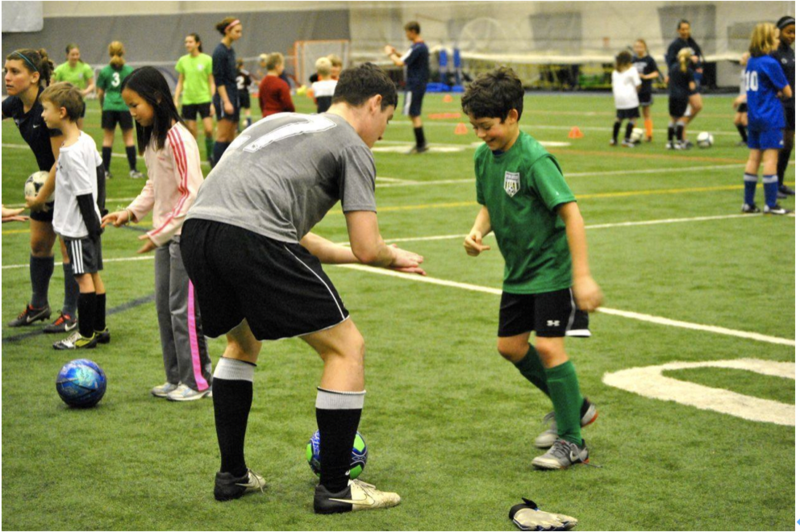 The clinic continues to thrive because of the dedication of the Penn State Soccer community. Evan Finney flying through the air. Mack died on New Year’s Eve 2012, just two weeks short of his 9th birthday. The first clinic was January 6, 2013. In honor of Mack’s birthday at that clinic and every one since, we draw two names and the Penn State team gives two autographed balls as “Mack’s Birthday Presents.” Another tradition of the Mack Clinic is the goalkeeping demonstration. The Penn State Keepers get up and demonstrate their acrobatic skills, the Mack patch proudly worn on their uniform. It is now six years after that first, remarkable clinic and we are preparing for the 7th Annual Memorial Mack Brady Clinic. There are still tears and sadness, but each year we stand in gratitude as we watch over 150 kids, running around, shouting, and having fun doing what Mack loved most. Mack’s buddies are now in high school and soon will be of the age to be recruited for college teams, perhaps even Penn State. They are still playing soccer and still remember their keeper. I think the clinic has met its original goal, to help them continue to play the game that Mack loved so much, that brought them all together in the first place. Now there are hundreds of other children who know about Mack and play the game he loved. Some, perhaps, may even have decided to become a keeper because of Mack. We are humbled, we are thankful, that together we remember Mack. This recollection was sent along by Dan Sheerin, the father of Penn State Goalkeeper Danny Sheerin. My son Danny was a sophomore goalkeeper on Penn State’s soccer team when I learned of the tragic loss of young Mack Brady on New Year’s Eve 2012, just days before Mack’s ninth birthday. Danny was home for the holidays when he heard about Mack’s loss, and he shared with me how Mack was a great young goalkeeper, and a huge Penn State soccer fan who faithfully attended both the Nittany Lion men’s and women’s soccer matches at Penn State’s Jeffrey Field. Danny also told me how Mack dreamed of one day playing goalkeeper for Penn State. While I had never met Mack, I immediately felt a tremendous sense of loss and grieving for Mack, for his family, for his soccer teammates, and all who knew him. I felt that as an old goalkeeper myself, as long-term member of the “Goalkeepers’ Union,” and as a GK who had played two years for the Penn State Mont Alto campus team before trying out as a junior for Penn State’s varsity soccer team, that I had shared some of the same hopes and dreams as Mack. 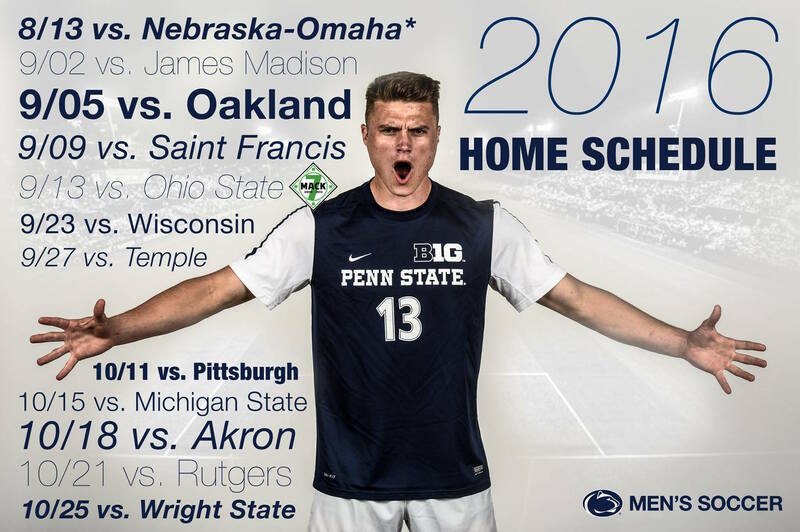 And when a when I saw the photo above as part of the announcement of the Mack Brady Memorial Soccer Clinic at Penn State, I felt that I had indeed seen Mack before, knew something more about him, and was in some way connected to Mack. For in the photo Mack was standing on the edge of Jeffery Field and just behind the goal – the exact same spot where I used stand for many a Penn State soccer game for over three decades. For standing there right behind the goal you can clearly hear the GKs calling out to their teammates in order to help defend Penn State goals. Standing there close to the goalkeeper, you can see and indeed feel first-hand what it means to be a tough, faithful GK, and what it means to always give all you have to help your team. So I felt, and will continue to hold in my heart forever, that Mack and I will always share some of the same dreams. 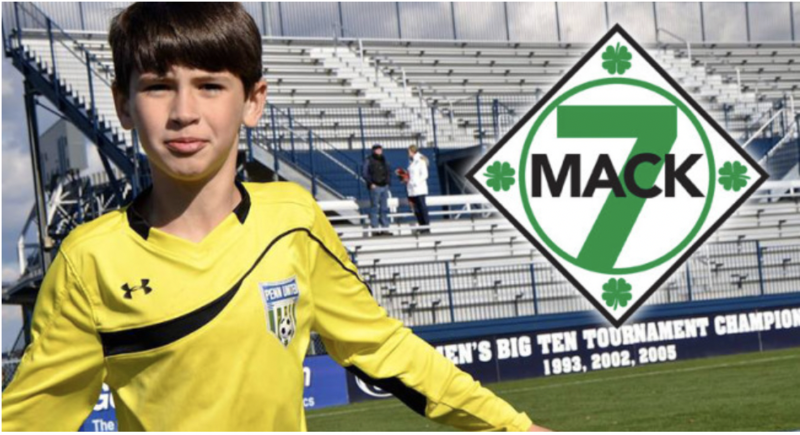 And in that same photo of Mack near the goal, I also recall that I saw for the first time the patch that is based on Mack’s GK jersey number “7.” Mack’s number 7 is also ringed with his State College Celtics Soccer Club’s green clover symbol. This same patch would become the patch that all current Penn State GKs wear today, and that all future PSU GKs will wear forever in the future as part of the Nittany Lions’ and Mack’s “Goalkeeper U.” And seeing this green Celtics’ 7, I thought of the green GK jersey my son Danny then proudly wore for Penn State, and his jersey number, i.e., “27.” I told Danny that from that day forward there would always indeed be “two number sevens” on the pitch as GKs for the Nittany Lions, any PSU GK wearing the number 27 — and Mack too. Looking ahead, I’ve attended most of Mack Brady Soccer Clinics, and my son Danny, now a PSU alumnus, and I will be there again for the 7th Annual Mack Clinic this Sunday. I am looking forward to once more being part of the great friendship and love that lives on through Mack, in his memory, and in his great affection for and dedication to his team, to outstanding goals, and to goal keeping. Dan also wrote the poem, “Mack Brady Keepers.” Thank you, Dan, for standing with us and being a dear friend.